For the sixth straight day, protesters have taken to the streets of Cairo as President Hosni Mubarak refuses to step down and end his 30-year rule. Our blog covers the latest news coming out of Cairo. 9:12 p.m. ET: Al Jazeera has been airing in depth reporting from the ground in Egypt with more reporters than any other international news organization. Now, however, Egyptian authorities have shut down the Qatar-based news network's Cairo bureau, Wired reports. "Regardless of the multiple attempts by the Egyptian authorities to deter and impede our reporting, Al Jazeera continues its comprehensive coverage of the landmark events unfolding in Egypt," Wadah Khanfar, Director General of Al Jazeera said in a statement. 9:09 p.m. ET: The Wall Street Journal is reporting that Chinese authorities have blocked the word "Egypt" from searches on Twitter-like microblogging sites in an indication of concern among Communist Party leaders that the unrest there could encourage similar calls for political reform in China. 9:00 p.m. ET: Palestinian police have blocked attempts to stage demonstrations against Hosni Mubarak in front of the Egyptian embassy in the West Bank, the New York Times reports. Ten days ago, Palestinian officials decided to block a similar attempt at demonstrating in favor of a popular movement in front of the Tunisian embassy. "The prime minister and President Obama were united in their view that Egypt now needed a comprehensive process of political reform, with an orderly, Egyptian-led transition leading to a government that responded to the grievances of the Egyptian people and to their aspirations for a democratic future." 4:37 p.m. ET: PLAINS, Georgia (AP) - Former President Jimmy Carter said the political unrest and rioting in Egypt is an earth-shaking event and that President Hosni Mubarak probably will have to leave office. His comments to a Sunday school class he teaches at Maranatha Baptist Church in Plains were reported by The Columbus Ledger-Enquirer. Carter said that as Mubarak's 30-year rule has continued, the Egyptian leader has become more politically corrupt. 3:22 p.m. ET: The U.S. Embassy in Cairo said it is arranging to begin flying Americans out of Egypt on Monday, the Associated Press reports. The announcement Sunday evening comes hours after the embassy advised Americans in Egypt to consider leaving the country as soon as possible. The statement said the State Department is making arrangements to provide those who want to leave with flights to "safehaven locations in Europe." 2:09 p.m. ET: The Egyptian government has extended the national curfew by an hour, from 3 p.m. to 8 a.m., starting on Monday, Reuters is reporting. 1:40 p.m. ET: Protesters at Tahrir Square have spelled "Down W/Mubarak" with their bodies, Al Jazeera reports. 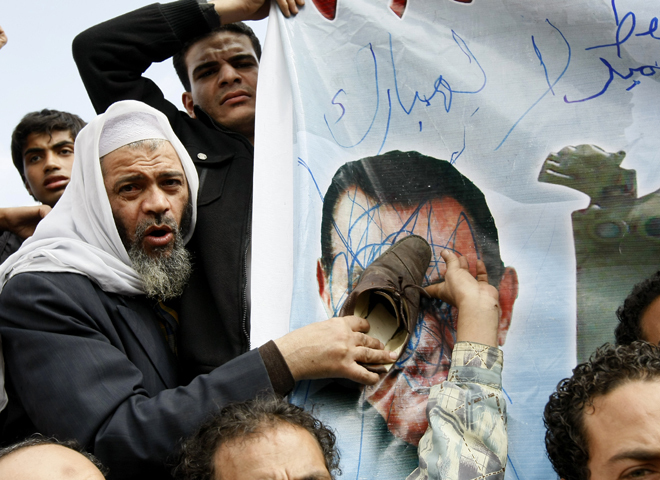 According to the same report, the primary demand among protesters remains the dissolution of the Mubarak government. 1:24 p.m. ET: Egypt state TV today showed a broadcast of Egyptian president Hosni Mubarak meeting with the newly-appointed Vice President, Omar Suleiman, and Prime Minister, Ahmed Shafiq, the BBC reports. A broadcaster said the purpose of the meeting was to "set the priorities of the new government," according to the BBC. 1:15 p.m. ET: The Guardian is reporting that among the prisoners who escaped during mass jail breakouts last night were "hundreds of members of the banned Muslim Brotherhood, Egypt's leading Islamist political party." 1:03 p.m. ET: Israeli Prime Minister Benjamin Netanyahu said he was "anxiously monitoring" the unrest in Egypt, according to the Associated Press. Netanyahu, addressing Egypt's political situation for the first time since protests broke out there six days ago, noted the peaceful relationship that Israel and Egypt have maintained over the last three decades, and emphasized that "our objective is to ensure that these ties be preserved." 12:55 p.m. ET: Al Jazeera reports that tens of thousands of protesters in the Egyptian city of Mansoura have joined the call for President Mubarak to resign. Meanwhile, despite the evening curfew in Alexandria, protesters there continue to march. 12:38 p.m. ET: The Associated Press is reporting that some police have returned the the streets of Cairo, almost two days after the city's longstanding police presence nearly vanished from sight. Meanwhile, Al Jazeera reports that the police are scheduled to return to Egyptian streets tomorrow. Security forces were partially replaced by the military during the police absence, and, in what appears to be an attempt to demonstrate military control, fighter jets swooped low over Cairo just before the late afternoon curfew today. 12:21 p.m. ET: The Guardian is reporting that Egyptian television viewers are unable to watch ElBaradei's remarks, because Al Jazeera remains blocked in Egypt. According to the Guardian, state television is instead showing footage of security guards outside a government building. 11:55 a.m. ET:Reuters reporting that ElBaradei tells crowds in central Cairo: "What we have begun cannot go back." 11:41 a.m. ET: Opposition figure Dr. Mohamed ElBaradei reportedly heading to Tahrir Square in Cairo. Reports that he has arrived at Tahrir Square. 11:05 a.m. ET:NYT's Tom Friedman on Meet the Press said that Egypt is in such a hole economically, it needs to grow at China and India rates. He said the U.S. should focus or hope for a peaceful transition, consensual politics and that whatever government emerges it is dedicated to ushering Egypt into the 21st century. Mubarak has had three decades to make a transition....hard to see something positive coming out of Mubarak relationship going forward. 10:40 a.m. ET:AP--Gaza Palestinian border official says Egypt has closed its border with the Hamas-ruled territory amid the raging turmoil in Egypt. Ghazi Hamad says he expects the closure to last several days. 10:40 a.m. ET:Dr. Mohamed ElBaradei tells Bob Schieffer on Face the Nation that President Mubarak "absolutely has to leave." "He absolutely has to leave, Bob. This is not me. This is 85 million egyptians. Yesterday it was the call for him to leave. Today it's a call for him to put to trial. The american government cannot ask the egyptian people to believe that a dictator who has been in power for 30 years will be the one to implement democracy. I mean, this is really a farce. I mean people here could be poor but they're intelligent. And the first thing which will calm the situation is for Mubarak to leave. Leave with some dignity. Otherwise i fear that things will get bloody. You have to stop the life support to the dictator. You have to root for the people. You are losing credibility by the day. On the one hand you are talking about democracy, rule of law, you know, human rights. On the other hand, you are lending support to a dictator who has continued to repress his people. Today as i am sitting here in cairo, jets are flying over cairo. We are completely, you know, the internet... the entire internet is shut. The satellite television station is shut. Stuff is being looted. Buildings are ablaze. It is a lawless country. I don't see how could you wait, you know, for Mr. Mubarak to leave?" "I think once Mubarak is out, you will see that a lot of these demonstrations will go home. I can bet you that once he decides or announces or is forced to leave, all the demonstrations will go home. And then we are capable here of then running a transitional, smooth transitional peace." 10:40 a.m. ET:Sec. of State Hillary Clinton on Face the Nation--We would like to encourage having the "voice of protest and civil society at table to design orderly transition to meet social and economic needs of people"....we want to see outcome of peaceful protest...to result in "true democracy, not a phony one." "This is an incredibly complex set of circumstances....let's begin to see meeting between government and members of civil society." 10:35 a.m. ET: CBS News' Liz Palmer reports from Cairo, as Egyptian jet fighters scream past overhead. The jets are not having any impact on dispersing the crowds. 10:30 a.m. ET: On CNN ElBaradei said that U.S. policy toward Egypt is "losing credibility," and that President Mubarak must make way for unity government. He advised him to leave "today." 10:05 a.m. ET: Al Jazerra reporting via Twitter--Egypt army has just told the crowd gathering at Tahrir Square that military will not go against the people; Helicopters flying over crowds in Tahrir Square- AJE correspondent says crowd cheers every time the helicopters come close. 9:48 a.m. ET: Reuters reports that Shell is planning to evacuate international staff and families from Egypt on Sunday. 9:14 a.m. ET: Secretary of State Hillary Clinton making the rounds of Sunday morning politics shows: No more "faux democracy" in Egypt; Egypt needs to respond to "legitimate aspirations" of its people to ensure long-term stability; Mubarak naming Suleiman vice president "is the beginning--the bare beginning--of what needs to happen"; "We are on the side of a democratic Egypt that provides both political and economic rights to its people." Sec. Clinton told Fox News: "We want to see an orderly transition so that no one fills a void, that there not be a void, that there be a well thought-out plan that will bring about a democratic participatory government." She told ABC News there have been no discussions regarding stopping aid to Egypt. 9:04 a.m. ET: Reports of two fighter players flying low over Cairo. The military shows some force in the air, but how does it translate on the ground? 8:45 a.m. ET: CBS News' Farhan Bokhari on the major political tsunamithat could envelop Egypt and the region. "Going forward, he listed the emerging possibilities, ranging from "a significant rise of Islamic militants in Egypt who will take a harder line towards the U.S. and Israel," to "Egypt becoming a symbol of change for others to follow." 8:30 a.m. ET: Gangs of armed men attacked at least four jails across Egypt before dawn Sunday, helping to free hundreds of Muslim militants and thousands of other inmates as police vanished from the streets of Cairo and other cities. The administration's restraint is also driven by the fact that, for the United States, dealing with an Egypt without Mr. Mubarak would be difficult at best, and downright scary at worst. For 30 years, his government has been a pillar of American foreign policy in a volatile region, not least because of Egypt's peace treaty with Israel. American officials fear that a new government -- particularly one dominated by the Muslim Brotherhood or other Islamist groups -- may not honor the treaty signed in 1979 by Mr. Mubarak's predecessor, Anwar el-Sadat. 7:50 a.m. ET: ABC News reported that a "senior administration official" said that President Mubarak needs to outline a "concrete process" for change in Egypt, including freedom of information, dialog with opposition groups and revocation of the 1967 emergency law that gives the government excessive power. 7:32 a.m. ET: Nobel Peace Laureates have signed an appeal addressed to the Egyptian government and that will be forwarded to the Heads of State and Government of the United Nations Security Council. "The document, that among the first signatories see: the Solidarnosh leader and former Polish President Lech Walesa, Mairead Corrigan Maguire, Jody Williams and Betty Williams, strongly urges to Egyptian institutions to ensure that "safeguard the freedom and safety" of protesters at this time took to the streets of major cities in Egypt and the opposition leader and Nobel Peace Prize Mohamed El Baradei, arrested and released during manifestations of a few days ago." 7:19 a.m. ET: CNN reported that the U.S. Embassy in Cairo is setting up flights on Monday for American citizens who want to leave Egypt. From the Dept. of State: "U.S. citizens in Egypt who wish to depart that the Department of State is making arrangements to provide transportation to safehaven locations in Europe. Flights to evacuation points will begin departing Egypt on Monday, Jan. 31." An estimated 500 people are associated with the U.S. Embassy in Egypt. Turkey is sending flights to evacuate an estimated 750 of its citizens from Alexandria and Cairo. "The information minister [Anas al-Fikki] ordered ... suspension of operations of Al Jazeera, cancelling of its licences and withdrawing accreditation to all its staff as of today," a statement on the official Mena news agency said on Sunday. "Al Jazeera sees this as an act designed to stifle and repress the freedom of reporting by the network and its journalists. In this time of deep turmoil and unrest in Egyptian society it is imperative that voices from all sides be heard; the closing of our bureau by the Egyptian government is aimed at censoring and silencing the voices of the Egyptian people. "Al Jazeera assures its audiences in Egypt and across the world that it will continue its in-depth and comprehensive reporting on the events unfolding in Egypt. Al Jazeera journalists have brought unparalleled reporting from the ground from across Egypt in the face of great danger and extraordinary circumstances. Al Jazeera Network is appalled at this latest attack by the Egyptian regime to strike at its freedom to report independently on the unprecedented events in Egypt." 3:01 a.m. ET: Reports on Twitter are circulating to the effect that Egypt is withdrawing Al Jazeera's press credentials.. Al Jazeera's Dan Nolan wrote in a tweet that Al Jazeera's licenses was being pulled. He then added: "Don't worry we'll still report what's happening in #Egypt no matter what new restrictions they put on us." 2:55 a.m. ET: Is the U.S. making a mistake by taking a too balanced position between the demonstrators and the Mubarak regime? That's the opinion of Carnegie Endowment's Marina Ottoway. In a piece she published today, Ottoway said the Obama administration was making a mistake by being too tepid. "Messages are circulating on the Internet to the effect that the United States is once again supporting authoritarianism. Washington must get off the fence and choose whether it wants to support democracy, and thus be on the side of Arab publics enraged by decades of repression, or whether it wants to continue supporting regimes that have been repressive for decades in the name of ill-defined strategic interests. It cannot do both." The same theme was echoed by demonstrators on Saturday. 2:40 a.m. ET: More on the reported jailbreaks overnight. Officials are telling the AP that the prisoners escaped from at least four jails after starting fires and clashing with guards. 2:25 a.m. ET: The Associated Press is reporting that Egypt has closed its border with the Gaza Strip. 2:18 a.m. ET: Egyptian military forces have begun patrolling the streets of Sharm el-Sheikh, the popular Egyptian resort village on the southern tip of the Red Sea, according to Al Jazeera. That has sparked rumors concerning the whereabouts of President Mubarak. 1:49 a.m. ET: An army presence reported in Suez, but no sign of the local police. 1:22 a.m. ET: Army tanks in Cairo have set up a roadblock on a road leading to Tahrir Square, the scene of mass demonstrations the last several days. "[My people] love me. They are upset because the internet is down." "I'm willing to take the following steps to show I'm willing to change. Number 1: I'm firing my cabinet. Number 2, I'm hiring a new cabinet, made up of members of my fired cabinet." 12:50 a.m. ET: As dawn broke in Cairo, reports circulated that several thousand inmates escaped from prisons during the night. Clearly, the situation remains chaotic and information is fragmentary. Egypt's stock exchange and banks are expected to remain shut on Sunday. 12:36 a.m. ET: Morning has broken in Egypt. The evening curfew will be lifted in less than 25 minutes.More than one hundred people have died during the last 24 hours. 10:04 p.m. France, U.K. and Germany release a joint statement on Egypt, calling for Mubarak to avoid violence and implement promised social reform. 8:33 p.m. While the U.S. government monitors the situation in Egypt, David Botti, an American freelance journalist in Cairo, noticed two small examples of American intervention and posted pictures of them to his Twitter account. In one photo (far left), a canister fired at demonstrators was manufactured in the United States. In the other photo (left), a man uses a McDonald's sign as a shield during a demonstration. 7:59 p.m. ET On the "CBS Evening News", Correspondent Elizabeth Palmer reports from Cairo how housewives, students and senior citizens joined with students to unite against a common enemy - President Hosni Mubarak, the former fighter pilot who rigged elections to keep a lockhold on power for 30 years.